Billy Bob Adventure is an addictive fast action game featuring 3D environments, thrilling story, and original sound score. Piloting a top-secret mobile helicopter equipped with nitro booster, energy shield generator, foam gun, and other cool gadgets, the player has to save beautiful flying islands and stop the invasion of alien bugs. This time, fixing the chaos of a failed scientific experiment is a nonstop drive. With enemies of all sorts, sixty action packed levels, and time working against the score, this free game presents a real challenge to outsmart the nasty creatures. 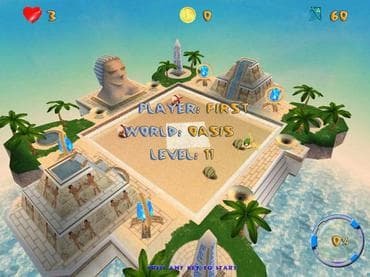 An immersive pastime for players, this game features: - Stunning 3D environments; - Thrilling story; - Sixty unique levels on four flying battlegrounds; - Various power-ups; - Lot of enemies and level bosses; - Adaptable difficulty for the whole family; - Multiplayer mode; - Original sound score and crisp graphics; - Fast action for players of all ages; - Long hours of immersive gameplay; - Free level packs. Download free full version game and enjoy fast action game! If you have questions about Billy Bob Adventure game, please contact us using this form.